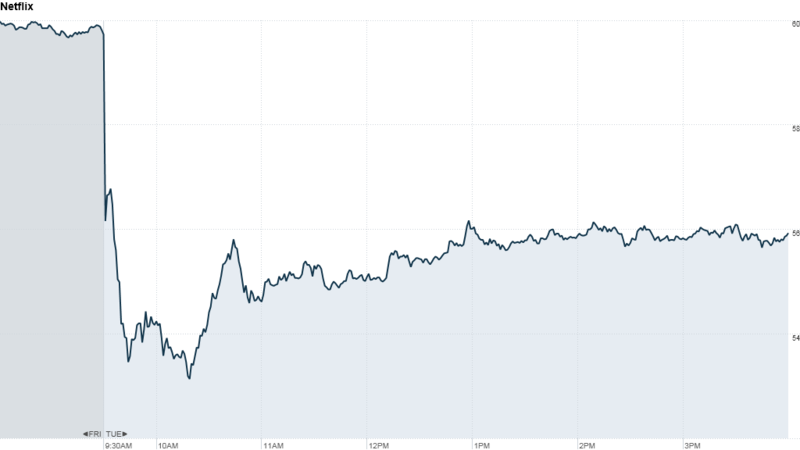 Click the chart for more on Netflix's stock. Netflix shares fell by as much as 11% on Tuesday after one of its formerly exclusive content partners struck a deal with rival Amazon. Amazon announced it's inked a deal to stream movies from Epix on its Prime Instant Video service. Epix is a Viacom-owned (VIA) company that owns the digital rights to many Paramount, MGM and Lionsgate movies. Netflix (NFLX) signed an exclusive deal with Epix in 2010, but the exclusivity clause expired September 1 -- leaving Epix free to partner with other services. Amazon (AMZN) splashed the news across its homepage on Tuesday, hawking both the Epix deal and its recent TV show contract with Comcast's (CMCSA) NBCUniversal. The Epix deal will add 2,000 movie titles to Amazon's Prime streaming service this year, including "The Avengers," "The Hunger Games" and "True Grit." On a post-earnings conference call in July, Netflix CEO Reed Hastings downplayed the importance of losing exclusivity with Epix, saying Epix's offerings are "not a particularly large source of total viewing." He also noted Netflix's non-exclusive contract with Epix runs through mid-2013. Yet investors have not shared Hastings' confidence. Shares ended Tuesday's trading session more than 6% lower, and the stock is down 23% so far in 2012. But any loss of content advantage has to hurt in a field increasingly crowded with competitors. In addition to Amazon, many other tech and media titans have been working to gain share in the streaming-video market. The list includes Hulu, Coinstar's (CSTR) kiosk service Redbox, Google (GOOG), Verizon (VZ) and many more. Meanwhile, Amazon's Epix deal highlights how difficult it has been for Netflix to retain its crown in the field it pioneered. The days of cheap contracts are gone; studios are demanding more money for their content as streaming video has become more popular, and they have a bargaining chip in the form of Netflix's rivals. That means Netflix hasn't been able to hold onto some of those all-important licensing deals. Most notably, contract renewal negotiations with Starz broke down last year, and Netflix lost access to that service's movies and TV shows at the end of February 2012. Loss of content could irk customers -- a dangerous game after many already became irate over a price hike last year.